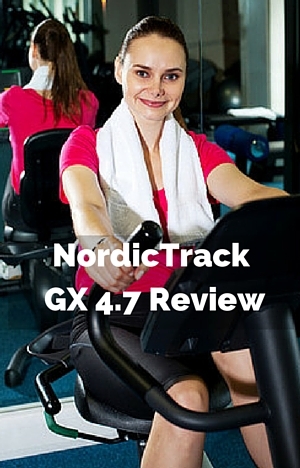 NordicTrack GX4.7 Recumbent Bike is one of the few recumbent exercise bike that is compatible with iFit which can give you a lot more choice and variety in your exercises – it can help to keep you motivated and prevent boredom. It has a comfortable looking seat with support for the back and seems to be easy to adjust for people of different heights. The console that provides you with a number of options for workouts too, over and above the ones you get with iFit.com. It also has some nice extras with speakers for playing your tablet or mp3 player through as well as fan to keep you cool as you exercise. It certainly looks like it can provide you with a comfortable and low impact workout to help with weight loss and get in shape. In this review we look at how well the bike operates in providing a good quality workout in your home and without adding any unnecessary hassles. It has a good solid steel frame and 25 inch stabilizer bars to hold everything steady as you exercise. There isn’t any wobbly or shaking, thereby providing you with the sturdy and steady base. You can get on with your exercise with no concerns about being tipped out as you exercise at whatever intensity you exercise at. If using on a floor that has some variation in it, you can turn the levelers under the rear stabilizer bar to balance out the bike to stop any rocking that might occur. They will be enough to compensate for most floors uneveness. The bike has one of the best warranties around – on the frame it is for its lifetime. The parts and labor have a one year warranty. The bike has an adjustable seat that can be positioned easily to fit the bike to people’s height to get the most effective and comfortable workout. Customer feedback indicates it will fit people between 4ft 10 ins and 6 ft 3 ins. (I’ve not been able to confirm this with the company). There is a adjustable lever at the side of the seat that you push down on to release the seat. You then move it backwards or forwards to get it to place for the right fit for you. You then pull the lever up hard to lock the seat in place. You can put the seat where you want you aren’t limited to pre-set positions so you get the best fit possible for each person where there leg can extend to just bent at the fr end of the stroke. It is quick to do so it can be used by multiple users. There’s no hassle involved in getting it set to annoy or put you off using the bike. You can be set up and ready to go in seconds. If you are under the minimum height above you may find you are stretching to reach the pedals and having to sit at the front of the seat which can be uncomfortable and not great for getting an effective and trouble free workout. Over 6 ft 3 ins you are likely to feel cramped and not get the full range of motion of your knee with your leg not being extended to slightly bent at the end of the pedal of the motion. It has 22 levels of resistance that are controlled via the console. It goes up incrementally from easy to hard. You can go up or down one level at a time using the + and – buttons on the console or jump to one of the 11 (out of 22) levels by pushing the quick jump buttons. Having the resistance levels displayed makes it easy to set the resistance you want to work at or return to a previous level when using the manual workout option. The console buttons control magnets that are near the flywheel. They never touch the flywheel as you adjust the resistance so there is no wear and tear and are very quiet, it also doesn’t require replacement or maintenance. You can easily set the bike for the level of resistance that suits your personal ability and fitness goals. You can set it manually or you can have it set automatically by one of the pre-set programs that come with the bike or the iFit. You can adjust the automatic resistance if it is too hard or too easy. It starts off very easy so that there is very little resistance making it very easy to push against. This should be okay for those that can only exercise with very little impact stress on their joints. It does go up to very difficult for those who want a real challenge to really test themselves. It has a 15 lbs flywheel and belt drive which helps to give a smooth pedaling experience – it helps to smooth out the pulsing that can help at the very top levels of the resistance as the weight can help to pull the pedals through the resistance when you’re not pushing on the pedals with your feet as happens at the top/bottom of the stroke. This is all covered up which protects it from damage but also keeps out of reach of kids and pets. It is all very quiet and shouldn’t require any maintenance. The pedals are attached to a 3 piece crank which give a strong and solid basis for secure pedaling. The pedals have grip on them and an adjustable plastic strap to keep your feet from slipping as you pedal. The plastic strap can be a bit hard to fix on to the pedal when adjusting the length until the plastic softens. They are the ones that have holes along the length of the strap and you fit that over a tab on the pedal to hold in place. Seat. It has a large sized seat (looks more like a car seat than a bike seat) and backrest to support you as you cycle. Most people find the seat comfortable. However, not everyone is going to find it that way and you may need to use a towel or cushion to add the extra comfort needed to be able to exercise for as long as you want. The angle of the backrest can’t be changed. The angle should provide the support to the right amount of support to your lower back so it can be used without discomfort. It moves with the seat when it is adjusted. Getting on and off the bike is quick and easy to do. It has a low level frame so you don’t have to lift your foot more than a couple inches to get it through the frame and in to position. You can then sit down on the seat like you were sitting on a chair, it’s the same when getting off the bike but in reverse. Noise The bike is very quiet. The loudest noise is likely to be heavy breathing as the result of exerting yourself on the bike. It means you can listen to TV without turning up the volume or disturbing others even when they are asleep. Also, if you are in an apartment your neighbors are very unlikely to know that you are working out. If you are concerned that the noise or vibration may transmit through the floor a rubber exercise mat will prevent the possibility of that happening. Cleaning . You won’t have a big job to keep the bike clean or cleaning up after it. The bike itself doesn’t generate dirt however you and others may sweat which can drip on the bike and the floor. It is important to wipe down the bike to avoid sweat starting it’s corrosive action – it only takes moments to do this. To keep the floor protected you may want to invest in a rubber exercise mat. Handlebars. There are 2 sets of handlebars – 1 set is either side of the console and the other set is on both sides of the seat. The front set of handlebars have the hand pulse sensors in them. They can be reached while still in your seat and leaning back against the backrest. You can also change the angle of the handlebars using the console knob at the back of the console. It can help in getting a more comfortable grip. They also useful when you want to get on and off the seat providing you with some support and leverage. Both sets of handlebars are covered to provide an easier grip and ensure your hands don’t slip or blister when they get sweaty. To store the bike you need an area of 25 ins by 57 ins. There is a handle on the back stabilizer that you use to tip the bike up and on to the transport wheels on the front stabilizer. This is fairly easy to do as most of the weight is at the front of the bikes. Most of the weight of the bike is then on the front wheels making it a simple job to move the bike to where you want it to go. The wheels work on all surfaces but work best on hard surfaces. You may want to test it on a wood floor before moving it across it to ensure they don’t scratch or dent it. The bike comes partly completed. Assembly takes between 1 and 2 hours to complete. Some people do find it difficult and can take up to 4 hours to get it done. It is more involved than other recumbent exercise bikes. The bike is heavy with shipping weight quoted at 149 lbs and the assembled weight 145 lbs so you may want to have someone help you to put it together – it will help in moving the box and holding pieces while they’re attached on to the frame. To finish the assembly you need to add the stabilizer bars, back rest frame, seat assembly, handlebars, seat, backrest, front upright, console cover, console and pedals. It seems they’ve added extra steps to the assembly to this process – making it more complicated than other similar recumbent exercise bikes. The display is 5 inch (diagonal) and is backlit making it easy to read the measures in all light conditions. The 5 inch display (diagonal) allows you to monitor your workout progress. It displays calories burned, calories per hour, distance, pulse (when gripping the hand pulse sensors), resistance, speed and time. To get a good reading of your heart rate you need to be gripping the sensors for at least 15 seconds. There are several display tabs that can show different sets of the information that you can show by pressing the display button. It also has a bar that gives a graphical representation as to how intense you are working out. The bike needs to be plugged into be used for resistance and the console. Without power you can’t change the bike resistance. You can use the bike in manual mode where you change the resistance as you go or you can select one of the 24 onboard workout programs (12 calorie and 12 spped workouts). The display shows the name, duration, maximum speed and resistance and where you are up to on the workout along with a profile of the workout. It is split into 1 minute segments with a suggested speed and a set resistance level. The speed suggested is a target if you want but you don’t have to take it on if you don’t want to. You can change the resistance using the console but when you move on to the next segment it will return to the programmed resistance. You can also set your workout goals for calories, distance or time. You start pedaling then press the select-a-goal button and then set your goal. Your progress is shown on the display. To use the IFit and Google maps functionality to be able to workout as if you are “outside” with rides from all around the world you need to purchase the IFit.com module which costs $99 a year. This module works with your WiFi to adjust the resistance for hill climbs and track where you are. I’ve not signed up for it. But from what I can find out without subscribing (you don’t seem to be able to get a free membership to iFit.com) is that it isn’t the easiest to work. You need to plug the iFit module into the console then you select your profile and then press one of the iFit buttons on the console to select the workout you want to use. If you remove the module (or don’t have one I think) you can push the iFit buttons on the console to tryout a demo workout. The power cord is plugged into the front of the bike which is not long and can limit where you place the bike unless you have an extension cord. If the bike doesn’t have power it can’t be used. It is important to be careful that you don’t damage the jack and point by tripping over the wire. For using the heart rate monitor you need to grip the hand pulse sensors in the handlebars at the front of the bike. They can be gripped without leaning forward away from the backrest. You need to grip both at the same time and for at least 15 seconds. These type of sensors aren’t the most reliable and many people struggle to get an accurate reading from them. This isn’t just a problem with this bike it is something that is common to all bikes with these hand pulse sensors. To turn on the console you can push any button or begin pedaling. The console turns off automatically after several minutes of inactivity. Below the display are the sets of buttons for controlling the workouts and the console. The first row of buttons help you to select the program you want to use and the display tabs you want to use with settings, home, up/down , enter and display buttons. The next set of buttons down allow you to choose iFit workout you want to choose – google maps, train or compete. You can also upload your results, or set a goal or choose a weight loss workout. The next set of button allow you to turn on the fan and choose speed settings, the volume, and speed and calorie buttons are used for selecting an onboard workout. Below this are resistance buttons where you can select the plus/minus buttons to move up one level. Between these button are 11 quick jump resistance buttons where you can quickly jump to a resistance setting of 2, 4, 6, 8, 10, 12, 14, 16, 18, 20 and 22. The bike comes with a number of accessories that can help make for a more convenient and enjoyable workout. At the front of the bike it has a water bottle holder which is at the top of the shroud that covers the flywheel. It puts the bottle in easy reach when you need a drink. It also have speakers that you can plug your MP3 or tablet into. The speaker volume is controlled on the console. To use them you need to supply your own audio cable to plug into the jack on the console and your player. There is a shelf on the console to place them onto but this will cover up the display and control buttons. There is a fan at the bottom of the console that blows a cooling breeze on to you. It is turned on and controlled using the fan buttons on the console. It will turn off by itself if the pedals haven’t moved for 30 seconds. It blows a nice breeze on you but it isn’t a strong wind so for some people it won’t be strong enough for them. Customer reviews have to date given this bike mixed ratings with 57% giving it a score of 4 or 5 and with 36% giving it only a 1 or 2. So, there is something causing an issue for a number of customers. The issues are to do with delivery and some people receiving a bike with defective parts. Which is an annoying problem in itself. But the company does compound this somewhat. They are difficult to get hold of and when you do get them they promise to send a replacement and forget to let you know that the replacement part is on backorder. So, most bad ratings are for bad customer service, which is disappointing and concerning. When customers receive a bike without quality control or delivery issues they talk in their reviews about how pleased they are with the bike with the biggest concern being the assembly being harder than it needs to be. They then find it sturdy and easy to use to get a low impact workout. It provides a lot of good functionality for the price and it is for the most part a very solid bike made from quality components for the most part (the plastic top shroud is a little cheap and is often broken on a delivery). You get a good console, reasonably comfortable seat, speakers, fan as well as low impact cardio workout that is gentle on the joints. When I checked pricing, on Amazon it qualified for Prime and free shipping. The NordicTrack GX 4.7 Recumbent Bike is suitable for beginners and those who want a tough challenging ride with the resistance going from very easy to very hard in 22 increments that are marked. The console has built in programs you can exercise along to which give you plenty of variety to help with motivation. You can also sign up to iFit.com for more programs and analysis but there is annual charge for this ($99). But,you can still get plenty out of the bike without subscribing. It has a comfortable seat that can be adjusted to fit people of a range of heights. It has a smooth pedaling motion so it is gentle on the joints. You can set the machine to the level of exercise you want. There has been issues with quality control and customer service and I hope they work on this as those customers that don’t have that problem seem to get a bike they like for low impact comfortable workouts. It provides a good solid basis for low impact cardio workouts which are great for getting into shape, losing weight as well as for intense cardio training. It is probably best to contact the supplier as they will be able to talk you through the best way to do this. My Nordic track commercial vr23 recumbent bike makes alot of noise when peddling. Is this normal? If not, what can I do to fix this problem? It shouldn’t be doing that. The best thing to do is to contact the supplier and they should help you get it sorted. Sorry I’m late replying. But it should be quiet. If you haven’t already I suggest you contact the supplier direct (there contact details should be in the manual) and they’ll be able to troubleshoot with you. I’m not sure exactly what the issue might be, my only suggestion is to contact the supplier’s helpdesk. Sorry it’s not something more practical. My brand new GX 4.7 recumbent exercise bike that started clicking as soon as I turned it on for the very first time. It sounded as if there was a relay trying to latch. It continued to make that clicking sound as I tried different resistance levels. That doesn’t sound right. It shouldn’t be doing that. Did you manage to get this sorted by yourself or with the help of the manufacturer? I recently bought a used Nordic track recumbent bicycle from a family member; it wasn’t used often. The monitor worked the first time I rode the bike, however it hasn’t worked since. I don’t know if it’s just a problem with the power cord or what. Do you have any suggestions? Where would I get a new power cord and what is the cost of one? I’d try the official site first. https://www.nordictrack.com/ They have a live chat function that can help you troubleshoot your problem. Thanks for the review. I feel like getting this bike soon. Where on the bike does the power plug in? The electrical socket is on the front frame of the bike. but for the same time on the GX 4.7, we get the SAME calorie reading!!! I think the best way to do this is to use an online calculator or app like myfitnesspal.com. Unfortunately the console GX 4.7 console ignores weight to give you an estimate as do most exercise bike consoles. The GX 4.7 is great until the pedals start slipping. The cost to fix is more than a brand new bike. This is a high fail issue and if it is out of warranty, you are out of luck. That’s not good. What was the cause? Was it the belt? Sorry to hear about your bad experience with the bike. What went wrong with it please? This bike was a mess as soon as I got it. It made noise after 6 months which i lubricated it. Than I stopped using it and went back on it and it started slipping. Tried to call someone and remember telling this person the problem. He never called back and the warranty just expired. I yelled and screamed and they gave me a partial credit after speaking to about 5 different people from Nordic Track and Sears. They then send me a new belt but you can’t put the belt on unless you take everything apart. Since you can’t get the belt on because the chassis is blocking it. Then I thought it may also be the crank since the belt didn’t look bad. So i said forget that let me still just ride it without the tension and what happens. The power don’t go on. Send for a new power chord and guess what. There is power since my test light and voltage tester shows power. But the Console don’t come on but it will flicker when you put a test light on the power. So the console probably is not good. Thanks for letting us know. Sorry to hear about your problems. Hopefully you had a better experience with the Schwinn. I recently inherited this bike after my SIL’s death. I plug the power cord in and nothing happens. Any suggestions? It’s difficult to know for sure – it might need a replacement power adapter. If you go to nordictrack.com they’ll be able to help with troubleshooting the bike. When I release the seat brake it makes a loud snap noise is that normal?